For other uses, see Museum of Flight (disambiguation). The Museum of Flight can trace its roots back to the Pacific Northwest Aviation Historical Foundation, which was founded in 1965 to recover and restore a 1929 Boeing 80A-1, which had been discovered in Anchorage, Alaska. The restoration took place over a 16-year period, and after completion, was put on display as a centerpiece for the museum. In 1968, the name "Museum of Flight" first appeared in use in a 10,000-square-foot facility, rented at the Seattle Center. Planning began at this time for a more permanent structure, and preliminary concepts were drafted. In 1975, The William E. Boeing Red Barn was acquired for one dollar from the Port of Seattle, which had taken possession of it after Boeing abandoned it during World War II. 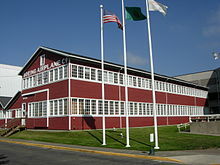 The 1909 all-wooden Red Barn, the original home of the company, was barged two miles (3 km) up the Duwamish River to its current location at the southwestern end of Boeing Field. Fundraising was slow in the late 1970s, and after restoration, the two-story Red Barn was opened to the public in 1983. That year a funding campaign was launched, so capital could be raised for construction of the T.A. Wilson Great Gallery. In 1987, Vice President George Bush, joined by four Mercury astronauts, cut the ribbon to open the facility on July 10, with an expansive volume of 3,000,000 cubic feet (85,000 m3). The gallery's structure is built in a space frame lattice structure and holds more than 20 hanging aircraft, including a Douglas DC-3 weighing more than nine tons. The museum's education programs grew significantly with the building of a Challenger Learning Center in 1992. This interactive exhibit allows students to experience a Space Shuttle mission. It includes a mock-up NASA mission control, and experiments from all areas of space research. Completed in 1994, the 132-seat Wings Cafe and the 250-seat Skyline multipurpose banquet and meeting room increased the museum's footprint to 185,000 square feet (17,200 m2). At the same time, one of the museum's most widely recognized and popular artifacts, the Lockheed M-21, a modified Lockheed A-12 Oxcart designed to carry the Lockheed D-21 reconnaissance drones, was placed on the floor at the center of the Great Gallery, after being fully restored. The first jet-powered Air Force One (1959–62, SAM 970), a Boeing VC-137B, was flown to Boeing Field in 1996; it arrived in June and was opened to visitors in October. Retired from active service earlier that year, it is on loan from the Air Force Museum. Originally parked on the east side of the museum, it was driven across East Marginal Way and now resides in the museum's Airpark, where it is open to public walkthroughs. In 1997, the museum opened the first full scale, interactive Air Traffic Control tower exhibit. The tower overlooks the Boeing Field runways, home to one of the thirty busiest airports in the country. The exhibit offers a glimpse into what it is like to be an air traffic controller. The next major expansion was opened in 2004, with the addition of the J. Elroy McCaw Personal Courage Wing. North of the Red Barn, the wing has 88,000 square feet (8,200 m2) of exhibit space on two floors, with more than 25 World War I and World War II aircraft. It also has large collection of model aircraft, including every plane from both wars. Many of these aircraft were from the collection of the Champlin Fighter Museum, formerly in Mesa, Arizona, which closed in 2003. The wing opened on June 6, the sixtieth anniversary of D-Day. In June 2010, the museum broke ground on a $12 million new building to house a Space Shuttle it hoped to receive from NASA, named the Charles Simonyi Space Gallery. The new building includes multisensory exhibits that emphasize stories from the visionaries, designers, pilots, and crews of the Space Shuttle and other space related missions. The gallery opened to the public in November 2012. Though the museum did not receive one of the four remaining Shuttles, it did receive the Full Fuselage Trainer (FFT), a Shuttle mockup that was used to train all Space Shuttle astronauts. Because it is a trainer and not an actual Shuttle, small group (no more than six persons, minimum age 10, maximum height 6' 4") guided tours of the interior are available, for an extra charge. The FFT began arriving in various pieces beginning in 2012. The cockpit and two sections of the payload bay arrived via NASA's Super Guppy. (British Airways), registration G-BOAG (open for walkthrough). This is one of only four Concordes on display outside Europe, with the other three being near Washington, in New York, and in Barbados. the world's first fighter plane from World War I. The one on display at the Museum of Flight was the only one ever built. The world's first jet airliner. First flew 1949, in production 1952 to 1964.
the sole surviving M-21 a variant of the Lockheed A-12. The surviving cockpit section of 61-7977, an SR-71 that crashed in 1968.
one of five surviving Aerocars, (automobiles with detachable wings and propeller). one of only two remaining airworthy DC-2s. the only surviving 80A, flown by Bob Reeve in Alaska. An ex-United Airlines B727-100, The Original Prototype. An ex-Trans-Canada Air Lines Super Constellation, located originally at the Toronto Pearson International Airport which was purchased in a controversial transaction in 2005. It is currently on display at the airpark. the world's first pressurized sailplane. On its grounds is the Personal Courage Wing (PCW) with 28 World War I and World War II aircraft from several countries including Germany, Russia, and Japan. There is also the "Red Barn", a registered historic site also known as Building No. 105. Built in 1909, the building was used during the early 1900s as Boeing's original manufacturing plant. Through photographs, film, oral histories, and restoration of work stations the exhibits in the Red Barn illustrate how wooden aircraft structure with fabric overlays were manufactured in the early years of aviation and provides a history of aviation development through 1958. In June 2007 the Museum opened a new space exhibit: "Space: Exploring the New Frontier", which traces the evolution of space flight from the times of Dr. Robert Goddard to the present and into future commercial spaceflight. The museum maintains a restoration facility at Paine Field in Everett with about 39 ongoing projects including a de Havilland Comet 4 jet airliner, a Jetstar, the Boeing 2707 mockup, a General Motors FM-2 Wildcat, among many. A previous project, the only flyable Boeing 247 in existence, is based at the restoration center. A restored Boeing B-17 Flying Fortress, the earliest flyable variant of the B-17 and a Boeing B-29 Superfortress in progress are currently hangared at Boeing Field. The B-17 is displayed seasonally in the summer, on the grass next to the Boeing B-47 Stratojet, in front of the Museum's entrance. The Harl V. Brackin Library at the Museum of Flight was founded in 1985. As of 2011, it contains 66,000 books and subscribes to 100 periodicals. It specializes in aerospace and aviation. There is also an online catalog. The Museum of Flight Archives is accessible to the public via the Kenneth H. Dalhberg Aviation Research Center. It includes millions of photographs and thousands of linear feet of manuscript materials. Highlights of the collections include the Gordon S. Williams photographic collection, the Peter M. Bowers Photographic Collection, the David D. Hatfield Aviation History Collection, the Norm Taylor Photographic Collection, the Elrey B. Jeppesen Aviation History and Navigation Collection, the American Fighter Aces Association Archives, the Lear Corporation Archives, and the Wright Airplane Company Collection. In December 2017, the Archives launched a digital repository. The site features digitized materials from archival, library, and artifact collections. In April 2019 the Archives began to make archival collections available and searchable online. The Airpark's Concorde in the foreground and Raisbeck Aviation High School in the background, 2014. 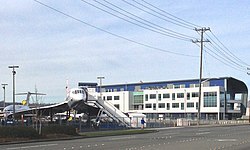 In September 2013, Raisbeck Aviation High School (formerly Aviation High School) opened in a new facility directly north of the Museum's Airpark. The school is operated by Highline Public Schools as a STEM school with a focus on aviation. The school operates in partnership with the Museum (which owns the land), Boeing, and other members of the local aviation industry. The facility will also be used for the museum's summer education programs when school is not in session. The new Aviation Pavilion spans the gap between the high school and the Space Gallery. The cover will also allow aircraft which are seasonally brought out, such as the Museum's Boeing B-17 Flying Fortress and Boeing B-29 Superfortress, to be put permanently on display. The Pavilion, constructed as part of the Museum's comprehensive Inspiration Begins Here! campaign, opened to the public in June 2016 and contains 18 of the Museum's most iconic aircraft. The 140,000 square foot building doubles the Museum's exhibit space, and was built with help from Sellen Construction and Seneca Real Estate Development. In late May 2019, the Museum will open the Vietnam Veterans' Memorial Park featuring the fully restored B-52 "Midnight Express" as the culmination of Project Welcome Home. The park will be free to the public. ^ "Twitter." "Twitter," Retrieved: October 13, 2016. ^ "Open Position at Museum of Flight: Senior Curator and Director of Collections" "Open Position at Museum of Flight: Senior Curator and Director of Collections," Retrieved October 13, 2016. ^ "Museum of Flight." travel.yahoo.com. Retrieved: September 2, 2011. ^ "Museum of Flight". Boeing Academy. Retrieved 28 September 2016. ^ "Museum of Flight Annual Report 2015" (PDF). p. 18. Retrieved 2016-10-29. ^ "Museum of Flight/Aviation High Press Release" museumofflight.org Retrieved: September 8, 2011. ^ a b Ogden, 1986 p. 193. ^ Truett, Jim (September 7, 1977). "Real expert in charge of flight museum". Spokane Daily Chronicle. Associated Press. p. 17. ^ "Old racetrack now museum of flight". Ellensburg Daily Record. UPI. September 19, 1981. p. 19. ^ "Flight museum taxiing". Spokesman-Review. Associated Press. October 22, 1980. p. A12. ^ a b "Air museum to open big gallery". Spokane Chronicle. Associated Press. July 6, 1987. p. A5. ^ "VIP's expected for flight museum opening". Ellensburg Daily Record. UPI. July 9, 1987. p. 7. ^ "Flight museum is open". Ellensburg Daily Record. UPI. July 11, 1987. p. 3. ^ a b "World's fastest plane Seattle-bound - slowly". Spokesman-Review. Associated Press. September 11, 1991. p. B3. ^ Ogden, 1986 p. 194. ^ a b c Szabo, Liz (June 21, 1996). "Original Air Force One retires". Allegheny Times. Beaver, Pennsylvania. Associated Press. p. A4. ^ "First Air Force One to open for public tours this month". Seattle Times. October 8, 1996. Retrieved September 25, 2014. ^ a b Lalwani, Sheila (June 19, 2002). "Museum of Flight's expansion takes wing". Seattle Times. Retrieved September 14, 2014. ^ "Museum highlights personal courage in new fighter wing". Moscow-Pullman Daily News. Associated Press. November 12, 2003. p. 3A. ^ a b Tu, Janet L. (June 1, 2004). "Museum to launch new warplanes wing". Seattle Times. Retrieved September 25, 2014. ^ "General History Fact Sheet." The Museum of Flight, 2004. Retrieved: August 9, 2011. ^ Williams, Lauren C. (June 29, 2010). "Seattle's Museum of Flight breaks ground in its big bid for a space shuttle". Seattle Times. Retrieved September 25, 2014. ^ "Photo Gallery: How to display a retired space shuttle." Collect Space. Retrieved: February 4, 2011. ^ a b Broom, Jack (Nov 7, 2012). "Museum of Flight's Space Shuttle Trainer exhibit opens Saturday". Seattle Times. Retrieved September 25, 2014. ^ "Space Gallery Construction Has Begun." The Museum of Flight, 2010. Retrieved: March 30, 2011. ^ Brown, Jack (June 30, 2012). "Super Guppy, with space-shuttle trainer on board, touches down at Boeing Field". Seattle Times. Retrieved September 14, 2014. ^ "Museum of Flight Awarded Full-Fuselage Shuttle Trainer." The Museum of Flight. Retrieved: 13 April 2011. ^ "First 747 called "City of Everett"". Spokane Daily Chronicle. Associated Press. July 12, 1971. p. 16. ^ "The first 747 jet folds its wings for retirement". Eugene Register-Guard. Associated Press. April 1, 1990. p. 7C. ^ "Concorde arrives, calls Seattle home". Spokesman-Review. Associated Press. November 6, 2003. p. B6. ^ Lawless, Jill (November 5, 2003). "Concorde jets prepare for quiet times ahead". Milwaukee Journal Sentinel. Associated Press. p. 3E. ^ Pyle, Richard (June 27, 2004). "Retired Concorde lands in museum". Southeast Missourian. Cape Girardeau, Missouri. Associated Press. p. 8A. ^ "Lockheed M-21 Blackbird." The Museum of Flight. Retrieved: September 2, 2011. ^ "Super Constellation CF-TGE." rbogash.com. Retrieved: November 26, 2010. ^ "Alcor Lamson." Archived 2012-08-19 at the Wayback Machine Activate Media, 2006. Retrieved: 20 May 2011. ^ "Lamson L-106 Alcor Glider." Museum of Flight, May 2011. Retrieved: 20 May 2011. ^ Baugher, Joe. "1942 USAAF Serial Numbers (42-001 to 42-30031)." American Military Aircraft. Retrieved: September 2, 2011. ^ "The Museum of Flight - Digital Collections". mof.omeka.net. Retrieved 2018-11-12. ^ "Archives at The Museum of Flight". archives.museumofflight.org. Retrieved 2019-04-17. ^ "Vietnam Veterans Memorial Park | The Museum of Flight". www.museumofflight.org. Retrieved 2019-04-17. Ogden, Bob. Great Aircraft Collections of the World. New York: Gallery Books, 1986. ISBN 0-8317-4066-3. 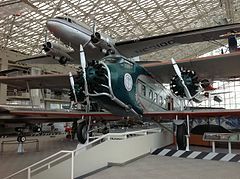 Wikimedia Commons has media related to Museum of Flight, Seattle.